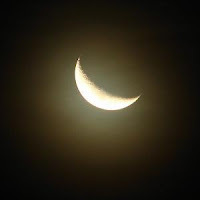 While enjoying my early morning run I looked overhead and saw a slight crescent moon shining in the pre-dawn sky. My runs have been more infrequent of late, since an aggravation of my left hamstring early this month. After rest and continuous strengthening at the local gym I tested it this morning with some limited success - a foundation on which to build while the running weather is still fine. As I run I have found that I prefer not to listen to recorded music (or recorded anything) through headphones. I would rather create my own music in my mind as companion to my run; sometimes my own music, sometimes tunes from other composers that have lodged in my memory. It enhances the enjoyment of the run. As the perspiration runs down my neck I journey on the lakefront trail - happy to be under the crescent moon. Brideshead has never been so magnificent as it is portrayed in the new cinema version directed by Julian Jarrold. Emma Thompson is scintillating in her portrayal of Lady Marchmain in an Academy award worthy performance. Standing out among the major roles are Michael Gambon as Lord Marchmain and Matthew Goode as Charles Ryder; but the whole cast is excellent. The film highlights the plot from the book with an ultimate focus on temptation; and the world between the wars, through eyes clouded by longing. The action of the book is compressed and intensified by the time limits of film, but with very few exceptions the story and character of the book are honored by this version. The adaptation is very creditable - it certainly shows the appeal of the story. Those who are really entranced by it ought to go and read Waugh's book and rent DVD's of the Granada miniseries--which was one of the best things ever produced for television. In Jarrold's film the youthful infatuation of Charles and Sebastian is portrayed somewhat more intensely and explicitly than the book, but not in any way other than what might be imagined by any truly empathetic reader. I am also willing to forgive the conflation of including Julia with Charles and Sebastian on the visit to Lord Marchmain and his mistress in Venice. The film is able to convey the overarching feel of decay and the themes of Catholicism and the oppressive relationship of Mother and children. While these themes are certainly important, I was more impressed by the beauty of the many scenes, especially Brideshead which was captured frozen in time as a sort of shrine, chapel and mausoleum for the family and their world. The overall vision of the director was stunning in every detail. As always, read the book, but in this case it is also worthwhile to see the film version. 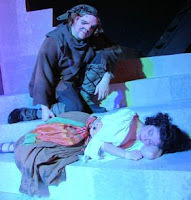 Currently playing at Bailiwick Repertory Theater is a musical version of The Hunchback of Notre Dame with Book, Music and Lyrics by Dennis Deyoung (based on the novel, Notre-Dame de Paris, by Victor Hugo). As with the novel, the musical evokes both Paris and the Cathedral along with its story of star-crossed lovers. 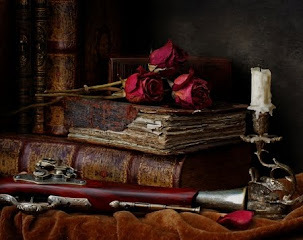 We are shown the encounter of beauty and the beast; the rivalry of the lovers (Priest, Hunchback and Soldier); the people with gypsies and their underworld; and, the impact on these characters' lives of fate, free will and the nature of desire. The Priest Frollo is torn between his duty to the church and the desires of his flesh for the lovely Esmerelda. Esmerelda is awakened from her simple innocence as she faces a fate leading inexorably to death and (a return to?) Paradise with Quasimodo who, being the true innocent and outsider, attempts to save her as her vision replaces his love for the Bells of Notre Dame. In the performance I attended last night the cast performed well with Evan D'Angeles, Gregory Franklin and Dana Tretta notable in the roles of Quasimodo, Frollo and Esmerelda, respectively; while Liz Pazik's portrayal of the gypsy Mahiette was outstanding. Deyoung's music with fine pacing and a mix of lively rhythms and love ballads helped the evening move along swiftly as the timeless story of ill-fated love kept the audience enthralled. The performance ended with a well-deserved standing ovation. 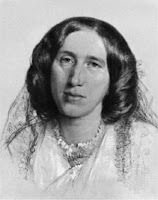 George Eliot visited Weimar in 1854 with George Henry Lewes, more than six years before the publication of The Mill on the Floss. Her experiences there would be used in several of her novels, all of which were yet to be written, including Daniel Deronda and Middlemarch (Haight, p. 151). It was also during this trip that Lewes was writing his life of Johann Wolfgang von Goethe. "But I can't give up wishing," said Philip, impatiently. "It seems to me we can never give up longing and wishing while we are thoroughly alive. There are certain things we feel to be beautiful and good, and we must hunger after them. How can we ever be satisfied without them until our feelings are deadened?" I have finally (after several recommendations of friends over the years) read The Selfish Gene by Richard Dawkins. Some of my immediate thoughts: I enjoyed his discussion of the importance of the gene through a dissection and diminution of the human being. I will, no doubt have to read it again to understand all the nuances of the work. Some of Dawkins' metaphors, while mellifluous, are potentially problematical, e.g. "We are machines created by our genes." They roll off the tongue well, and I will no doubt use them in conversation but I am still trying to understand the subtleties of his scientific utterances. I have not yet wrapped my mind around a “purpose-intent” set of genes. The answer is probably hiding there the cloud of new ideas and I missed it, but they have lasted for more than a quarter century and Dawkins has established the concept of "meme" which has become ubiquitous. The book was fun, educational, and thought-provoking to read. I hope my genes will allow me to learn more about this area of science. Also, I wonder why the idea of selfishness, whether it exists as a gene, or as a learned philosophy is not given a fair shake as a possible remedy for some agreed upon social ills. Is it not possible that Ayn Rand had it right in her concept of selfishness as a virtue? I have slowed in my postings, as it has been a week since my last, but life continues and yesterday I saw a film that is worth noting. 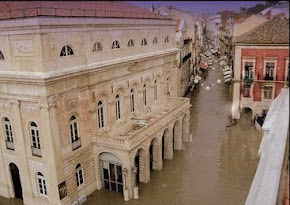 I am a fan of the French cinema so I try to see French films when they open at my neighborhood cinema. With the "critic's choice" recommendation of the Chicago Reader in my pocket I went to see Tell No One (Ne le dis a personne) directed and written (from a book by Harlan Coben) by Guillame Canet. It was a suspenseful and well-acted film that managed to start with an impossible situation, an e-mail message from someone supposedly dead for eight years, and continue to build suspense until the final piece falls into place very close to the end of the film. The story focuses a pediatrician, Alexandre Beck, who misses his beloved wife Margot who was brutally murdered eight years ago when he was the prime suspect. When two bodies are found near where the corpse of Margot was dumped, the police reopen the case and Alex becomes suspect again. The mystery increases when Alex receives an e-mail showing Margot older and alive. When a photographer is killed and Alex is framed he is on the run for much of the second half of the film - trying to elude the police and find out why his wife is alive and has been missing for eight years. Canet respected the author's original work (which I must consider reading) and the cast is absolutely excellent ! François Cluzet (with a resemblance with Dustin Hoffman) is a perfect Dr Beck. Kristin Scott-Thomas, André Dussolier (can be a naughty character too), Jean Rochefort and the others are great as well. I highly recommend this as one of the best films, French or otherwise, that you will see this year. Tell everyone! 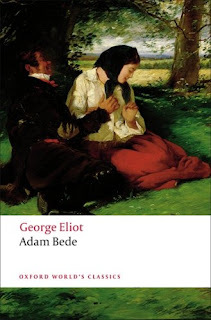 George Eliot's Adam Bede lives in the charming rustic countryside and adheres to a stoic version of the Puritan work ethic. His world is disrupted by both the classic temptation of Eros in the form of the too beautiful Hetty and the dissenting spiritual views of the Methodist preacher Dinah Morris. The author controls the narrative and lectures the reader as the other characters, brother Seth, Arthur Donnithorne, the Poysers, and the Rector Irwine are intertwined in the the fates of young Hetty and Adam. 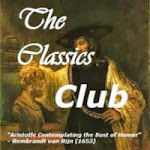 The novel succeeds in conveying the bucolic charm of the place while almost convincing us of the inevitability of fate. Above all, the characters are interesting and believable. My favorite, the Rector Irwine is notable in his interest in the classics and his disdain of preaching. Hetty Sorrel, the narcissistic young girl is harder to believe or understand, but she certainly has the requisite beauty to catch the eye of the aristocratic young Arthur who lets his emotions hold sway over his reason (insufficiently developed to handle this battle). Rereading this early novel of Eliot suggests the potential that she would fulfill in her later work, particularly Middlemarch.